The pre-season roster includes 39 players returning from the 2010 squad. The strength of the team would appear to be its defense which could return as many as nine starters from a unit that allowed only nine rushing touchdowns over 10 games, among the best in NCAA Division III. The offense faces a major rebuilding job with the return of just two starters. The co-captains of the team will be senior Josh Droppers of Portage (Portage Northern HS), junior Brian Lynn of Holland (Holland HS), Ben Van Ausdall of Hudsonville (Unity Christian HS), and Kyle Warren of Grandville (Unity Christian HS). Droppers and Warren are two-time All-MIAA first team honorees, Droppers at offensive tackle and Warren at defensive back. Droppers and senior guard Alex Doman of Royal Oak (Brother Rice) are the only returning offensive starters. Among the returning players who saw considerable action last season is sophomore tailback Shawn Jackson of Granger, Ind. (Camden Frontier HS) who in five games as a freshman rushed for 397 yards on 81 carries, a team-best 4.9 yards per carry average. His accomplishments included a 93-yard touchdown run, second longest in school history. Bringing experience to the defense are three players who have lettered for three seasons - back Dan Karam of Grosse Pointe Woods (Warren DeLaSalle HS), end Jared Kimber of Bedford, Ohio (Bedford HS), and back Kyle Warren. Warren has been in the starting lineup since his freshman year while Karam, and senior back Marcus Bradstreet of Grandville (Grandville HS) have been starters the past two seasons. The Flying Dutchmen return experienced special teams players. Sophomore punter Aaron Thompson of Imlay City (Imlay City HS) was named to the All-MIAA second team as a freshman. Twice during the 2010 season he was named the MIAA's special teams player of the week. He averaged 37.2 yards per punt, had none blocked in 63 attempts and had four punts go over 50 yards, including one covering 70 yards. Placekicker Evan Finch of Ann Arbor (Pioneer HS) was a perfect 16-for-16 on PATs and made 2-of-3 field goals. Senior Chris Schmelz of Chelsea (Chelsea HS), who will move from the defensive backfield to the offense at wide receiver, was among the NCAA Division III punt return leaders in 2010, ranking 20th nationally with an average of 12.7 yards on 17 returns. The Flying Dutchmen, who will be seeking their first non-league victory since the 2004 season-opener, open on the road at Illinois Wesleyan on Saturday, Sept. 3. 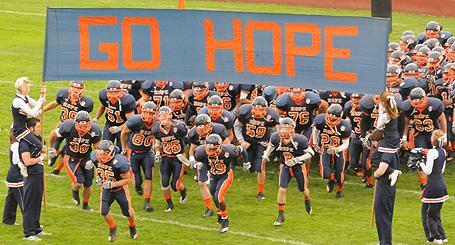 The home opener will be the traditional Community Day game against Wisconsin Lutheran on Saturday, Sept. 10. A season highlight will be a night home game against longtime MIAA rival Kalamazoo on Saturday, Oct. 8. Homecoming will be a week later with the Albion Britons coming to town.